Variety is the spice that gives life all its flavor. Meet Janet Muriungi of Thuura Rwathuka Self-Help Group of Nyaki East Ward, North Imenti Sub-county of Meru County whose group has been working with ICE since 2013. From the time, her farm has never been the same again. Just like many other community members in Kenya who depend on agriculture for their livelihood, the Rwathuka group members were almost losing hope in farming. From the year 2013, ICE started reviving their hope in farming through promoting agro-ecological farming in order to build resilience of the smallholder farmers in the region. According to Janet, agro-ecology is her satisfaction. Her farm is what an English man would call an orchard. As you enter Janet’s farm, you experience real interaction with nature – different vegetation types, fruits, vegetables, cereals and livestock just to mention a few, living in harmony with nature. What inspires Janet to do all this? This is a question that she gladly answer in one sentence, “the fruitfulness of diversity and essence of the beauty in variety”. All plants here are in harmony, no plant looks out of place and all coexist as they grow. This is the kind of beauty that the Nobel Laureate and Environmentalist the Late Wangari Mathaai envisaged. In Janet’s farm, maximum efficiency is realized as waste of one enterprise is an input to another. In her one – quarter acre piece of land, she has diversity of both plants and animals whereby fodder and residues from cereals feed livestock, while the manure produced is used to fertilize her farm for increased crop production. Such is the harmony within that agro-ecosystem! 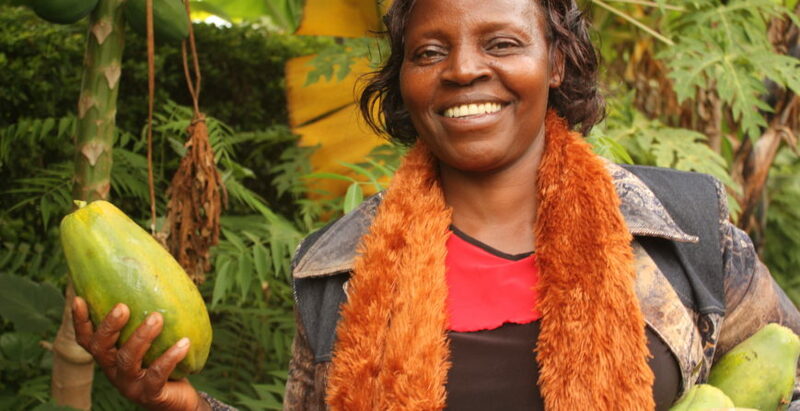 Janet has been able to produce enough nutritious food for her family and make extra income of an average of Kshs.7,000 per week from the sale of surplus produce. Janet is also the chairperson of the Thuura Rwathuka SHG and by the look of her farm she portrays a leader that leads by example. Janet’s shows part of what she harvests from her compound fence. Also add me to ICE News. ICE works with community groups and schools in Tharaka Nithi, Machakos, Meru, Murang’a, Embu and Kiambu counties to promote the role of culture in environmental and resource management.